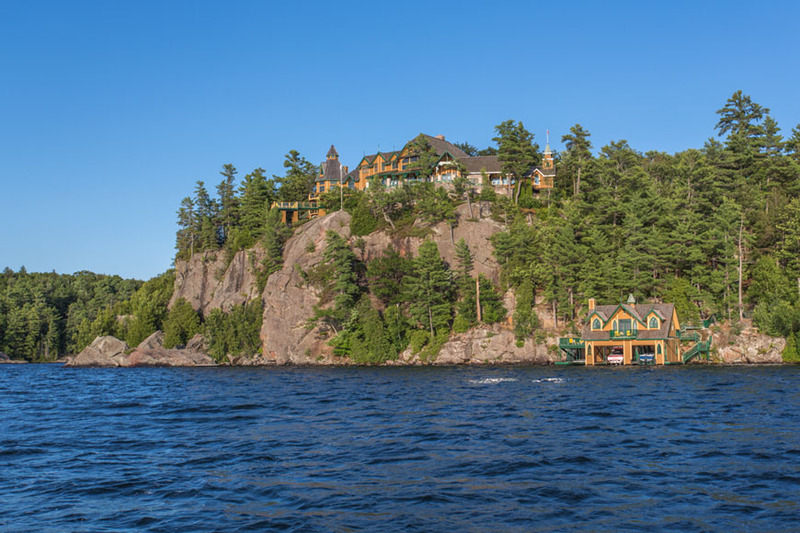 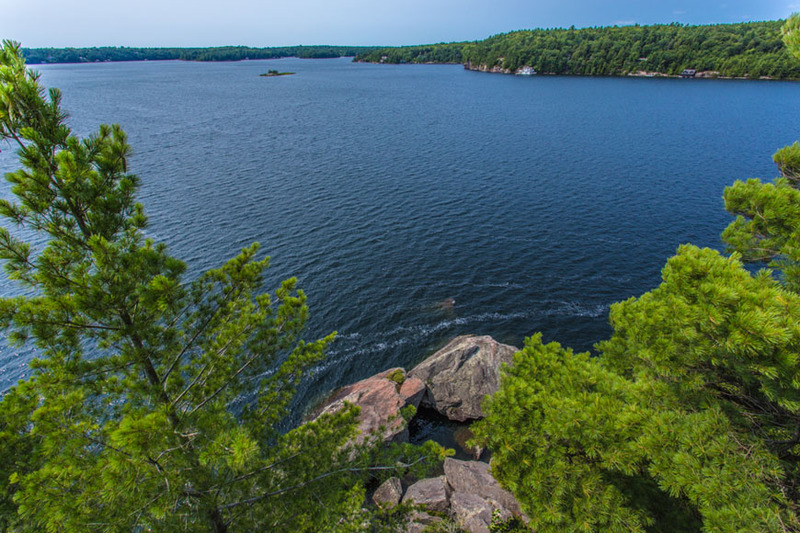 This is the pinnacle of Lake Joseph; the beauty of Muskoka’s most desirable and prestigious lake culminates atop a magnificent granite precipice. 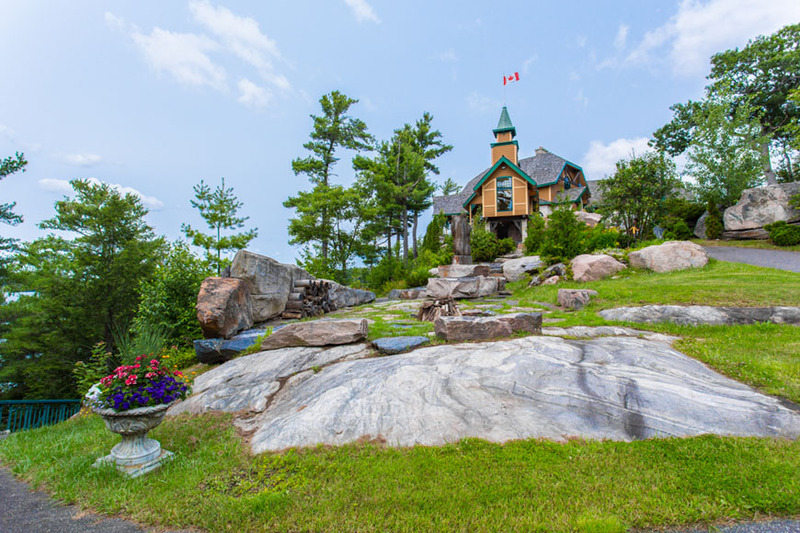 Elegantly adorned with an 8,000 square foot cottage of incomparable character, charm, and grandeur, this landmark Muskoka property, with spellbinding views and otherworldly sunsets, is quite simply an unprecedented and unparalleled luxury cottage estate. 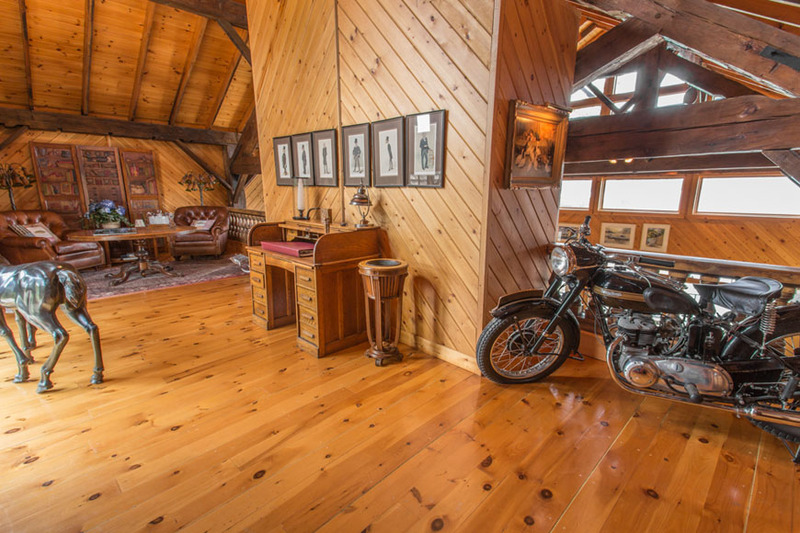 A tree-lined driveway leads to this immensely private property surrounded by thousands of acres of natural bush. 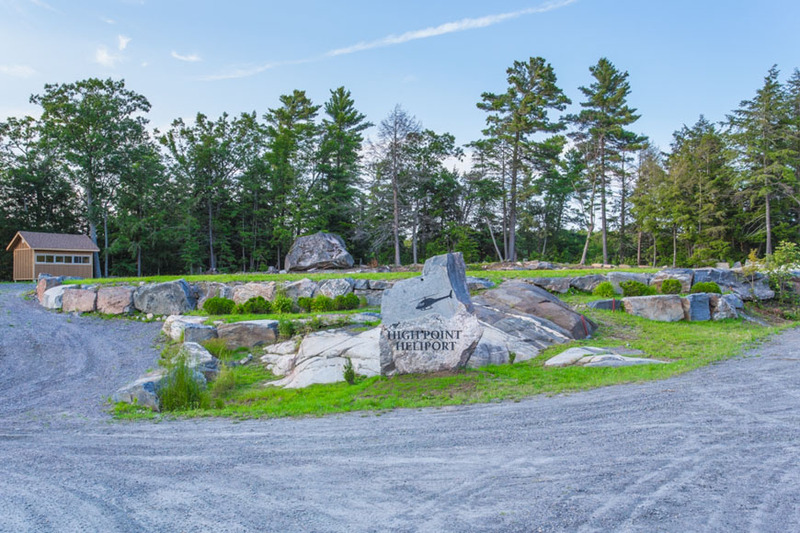 While the entrance by automobile through massive granite boulders is quite amazing, a time-saving travel option exists in the form of the on-site heliport designed to accommodate commercial size helicopters. 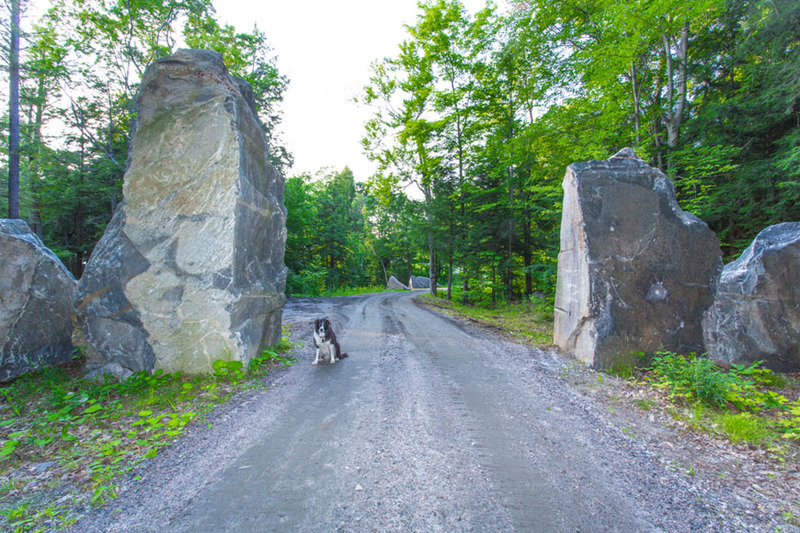 After arrival, the ultimate in privacy is assured at the top of the sheer rock face at this 65-acre estate property, which could be severed into two lots to permit the creation of an expanded family compound. 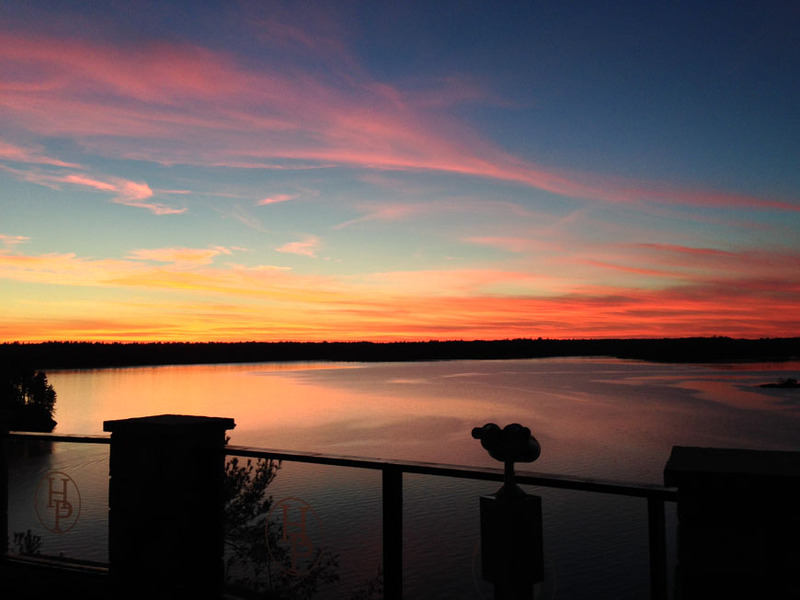 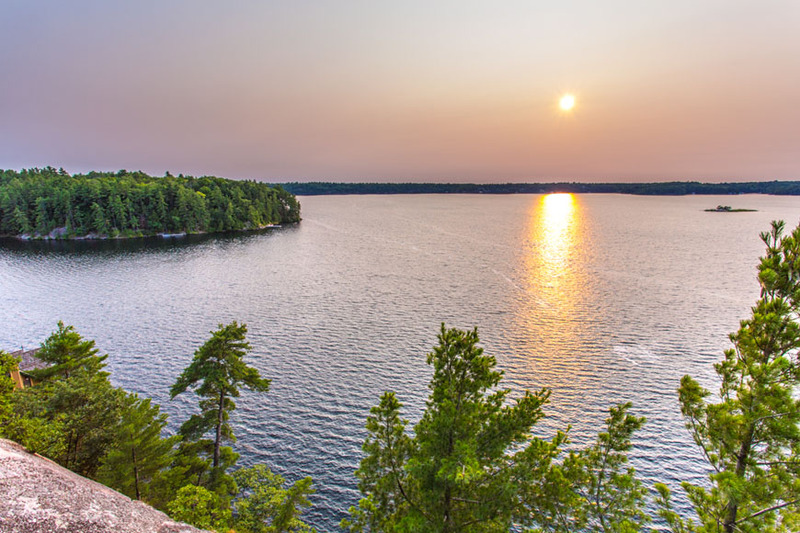 From this unequaled vantage point, the incredible western view is arguably the most spectacular on any of the Muskoka lakes, and the sunsets are truly magical. 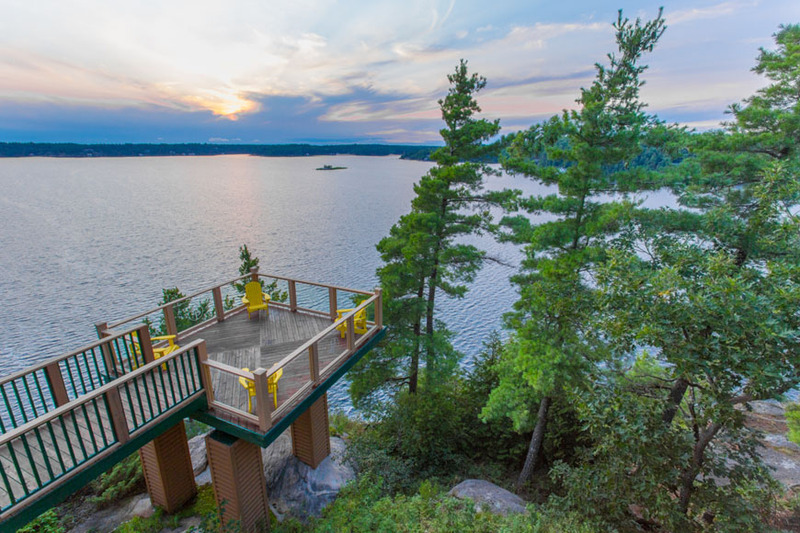 A ramp from the sweeping, wrap-around cottage deck leads to the “lookout”, where one can sit amongst treetops and enjoy the endless views feeling on top of the world. 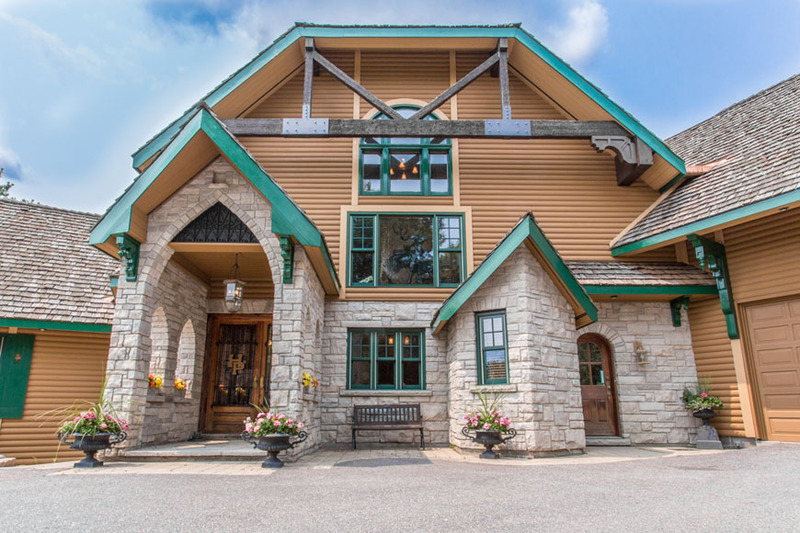 The grounds of this one-of-a-kind property were designed to accommodate large parties and functions. 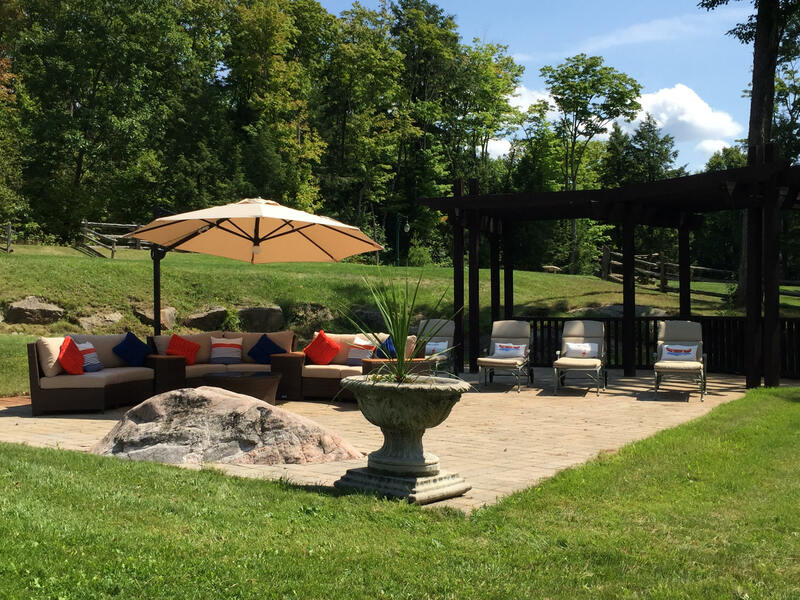 The expansive stone patios and decks, a built-in fire pit with granite slab seating, and grassy level lawns are ideal for outdoor entertaining. 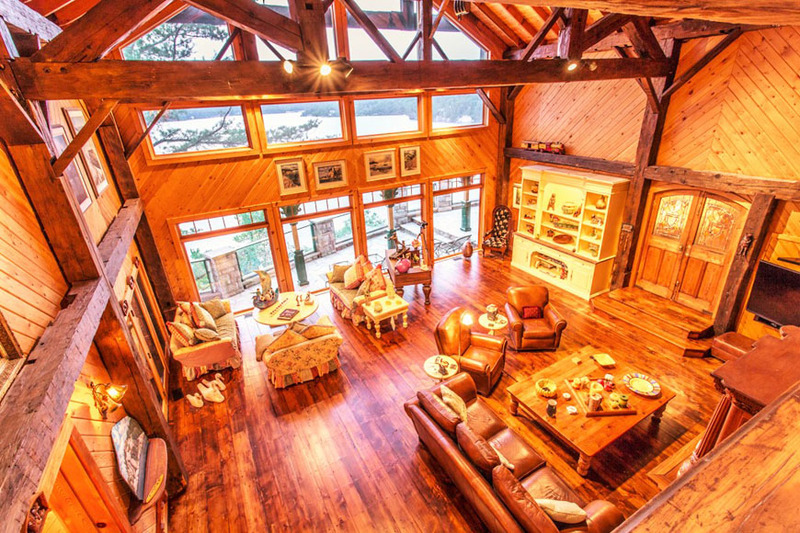 While the cottage was designed to handle these large events, it maintains a warm and intimate atmosphere, making it a cherished and inviting family gathering spot. 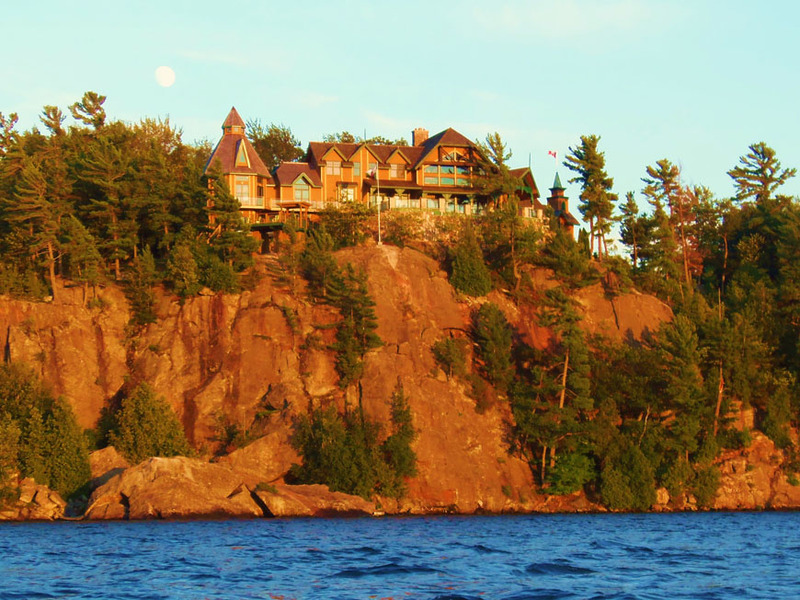 Nestled on the dramatic cliff, this exquisite lake home features a majestic Great Room boasting a Rumford fireplace with a stunning hand-carved mantle, first growth exposed beams, pine floors, and a wall of windows spanning the front that soars into the heights of the cathedral ceilings framing captivating lake views. 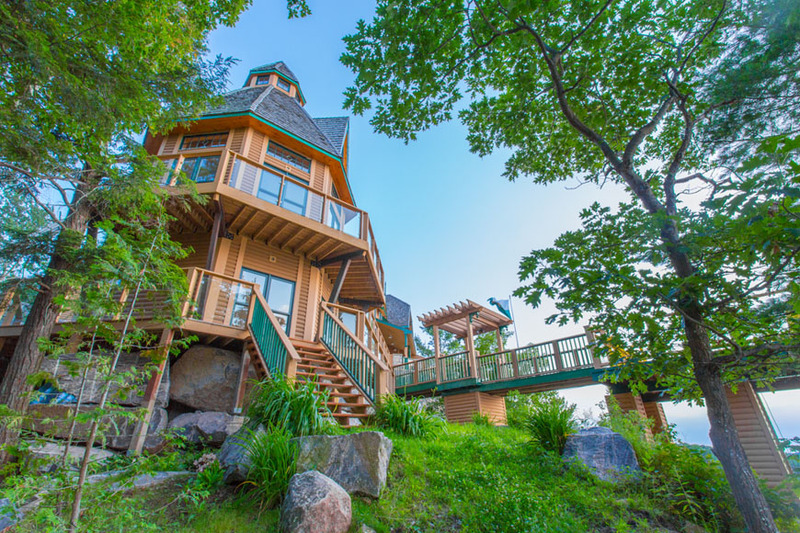 The architecturally beautiful recent addition features an octagonal living space with a Muskoka stone fireplace, walkout to the deck, and a gorgeous, pointed turret ceiling with remote controlled windows at the peak. 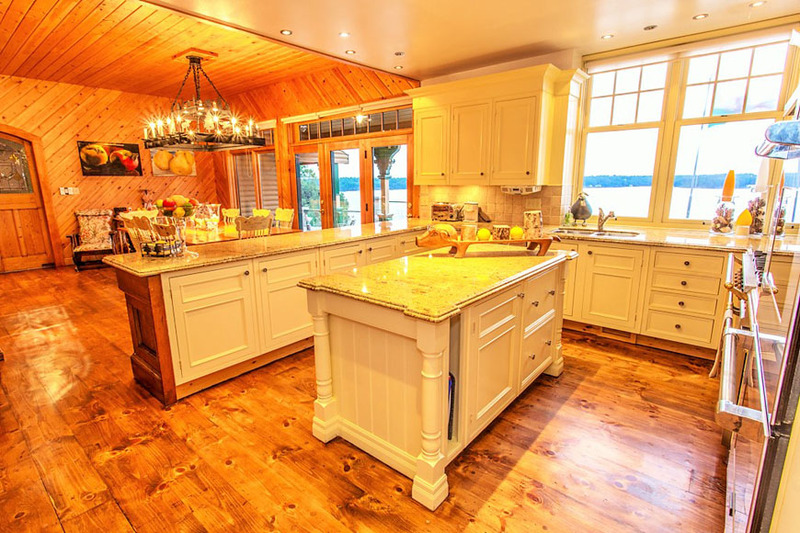 The kitchen was carefully created with entertaining in mind and is well appointed with 2 islands, 2 dishwashers, a Lacanche gas stove, 4 ovens, massive side-by-side fridge and freezer, an additional fridge, walk-in pantry, and a walkout to the BBQ area which has a propane connection. 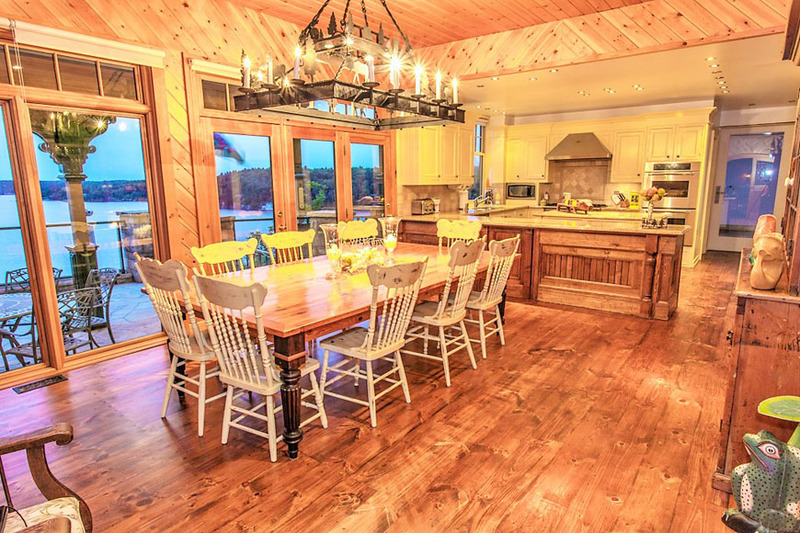 The expansive dining area is tastefully decorated with a custom made chandelier. 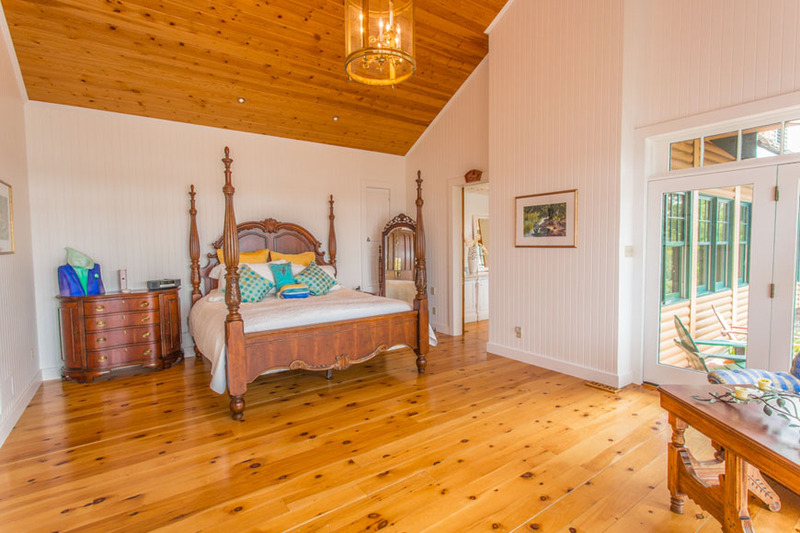 Each of the 7 cottage bedrooms has either an ensuite or a bathroom for its own exclusive use. 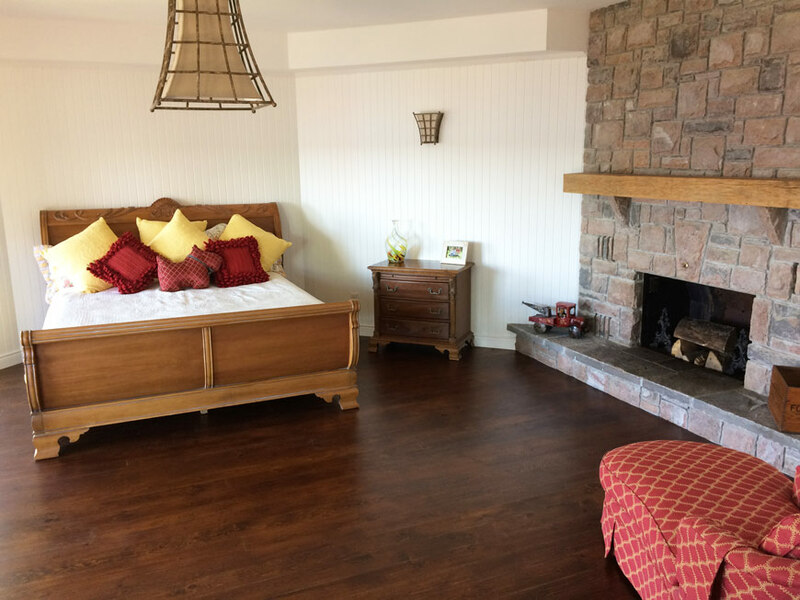 The gorgeous upper boathouse suite, complete with wood-burning fireplace, living room, bedroom, bathroom, and kitchenette area provides additional accommodation. 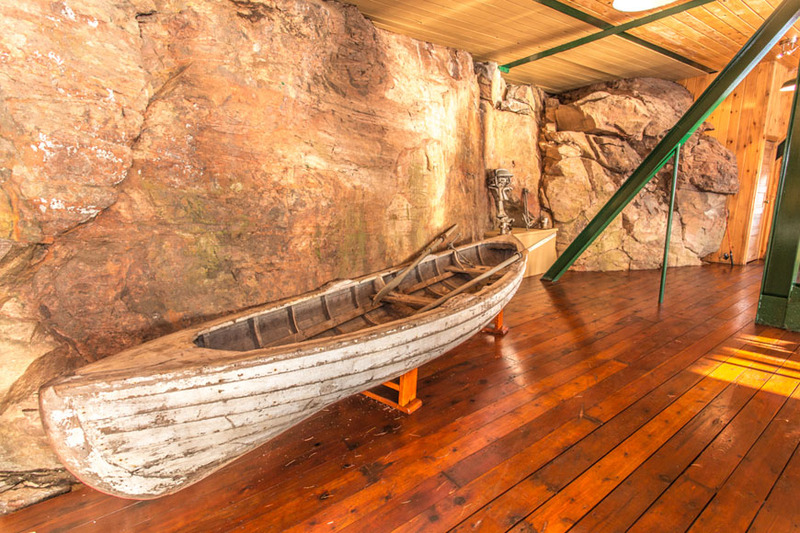 Outside the cottage, for the more adventurous, foot paths lead to jumping rocks, a natural grotto, and to a wonderful flat swim rock on the lot’s south side located just inside a sheltered bay. 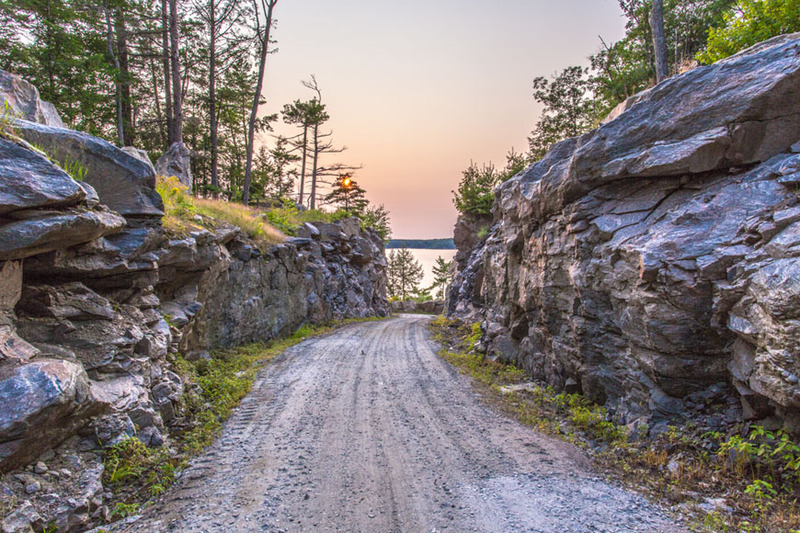 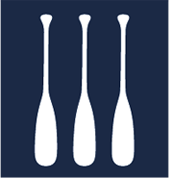 Alternatively, take a vehicle as large as a car or SUV down the gentle, picturesque driveway to the boathouse, which has been masterfully cut through Canadian Shield granite. 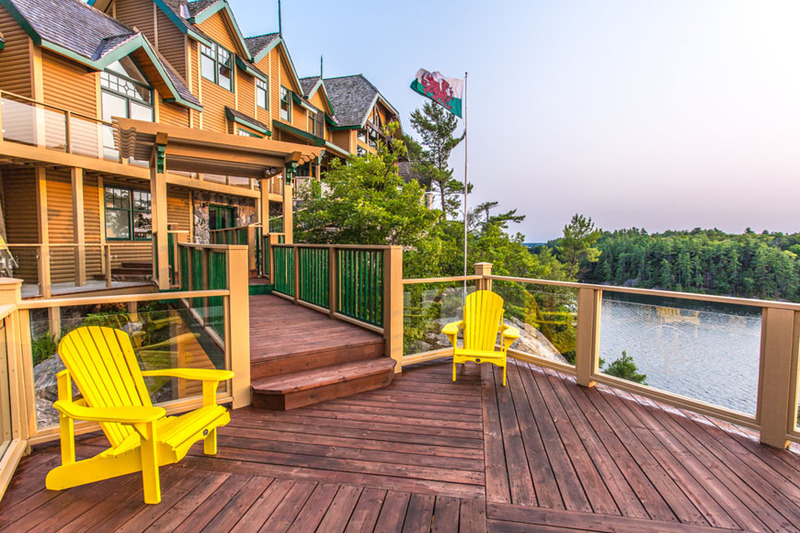 Impressive attention to detail and appreciation for classic Muskoka décor create the cottage’s unique and eclectic personality. 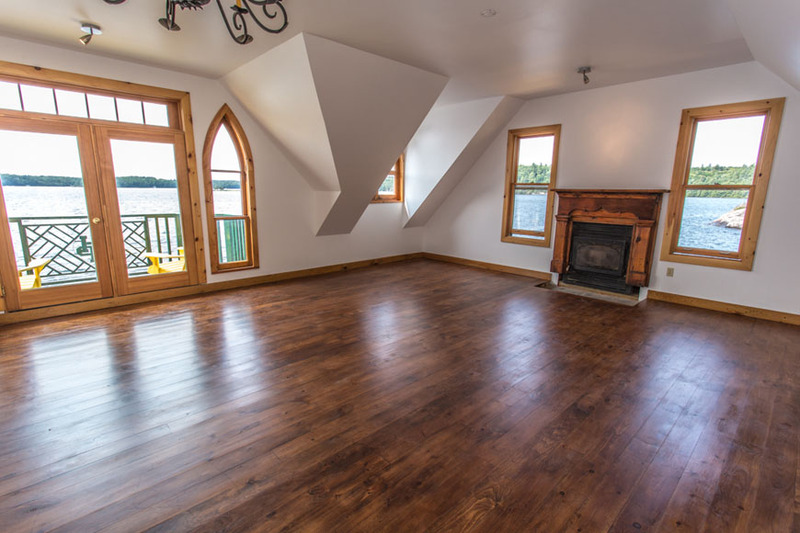 Carvings of indigenous Canadian animals are blended subtly into the top of every door frame. 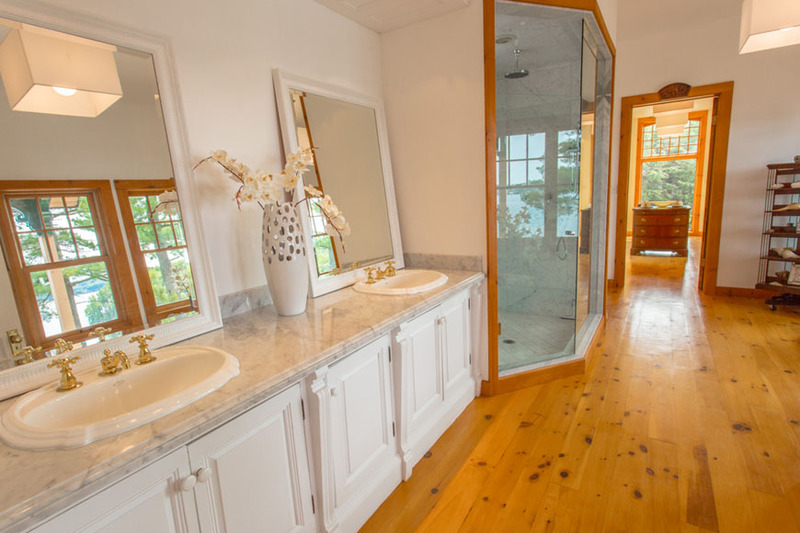 All of the bathroom vanities and the doors in the cottage are antiques. 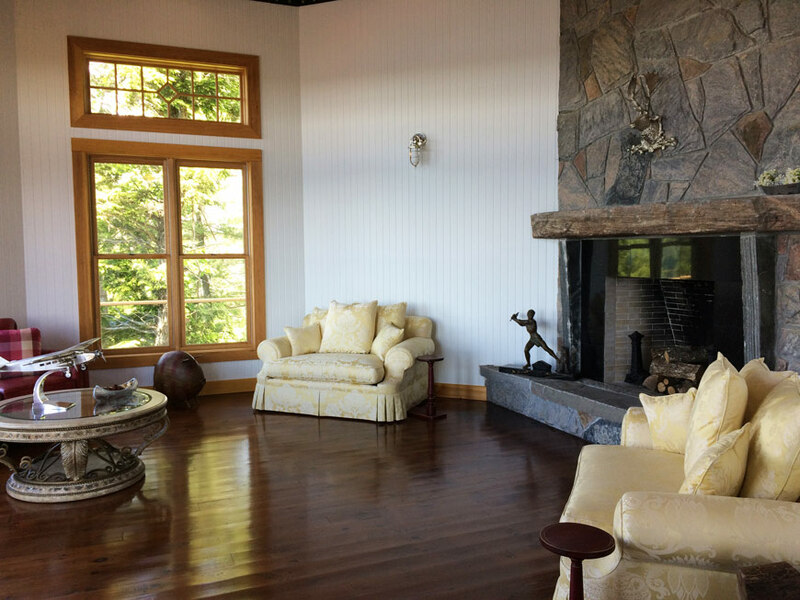 Decorative etched glass forms the windows looking from the upper level landing into the main living area. 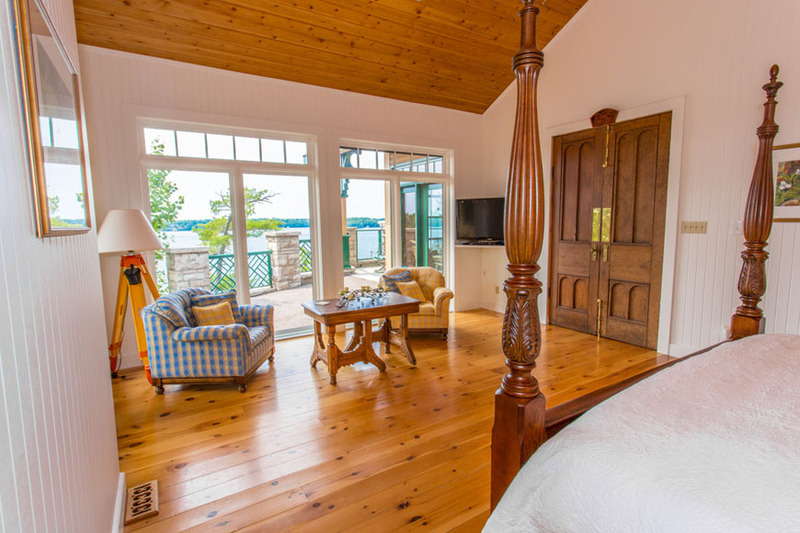 Every main room has a view of sparkling Lake Joseph. 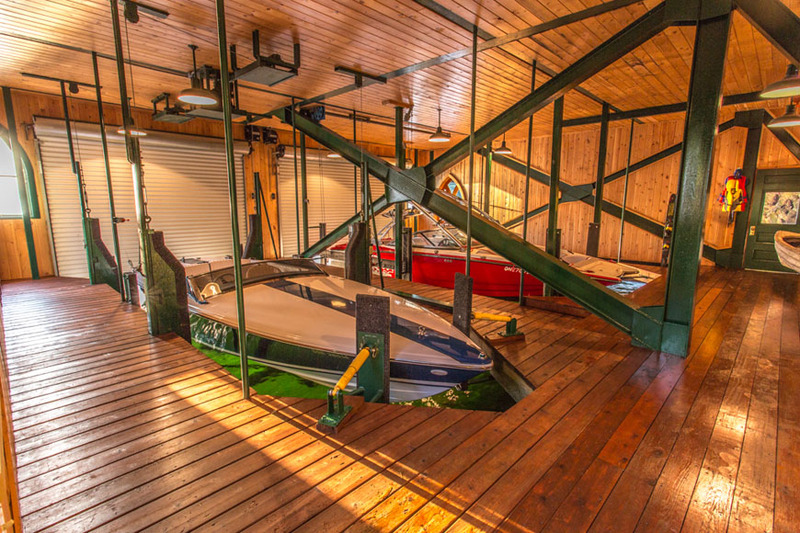 Not a single modern convenience has been overlooked. 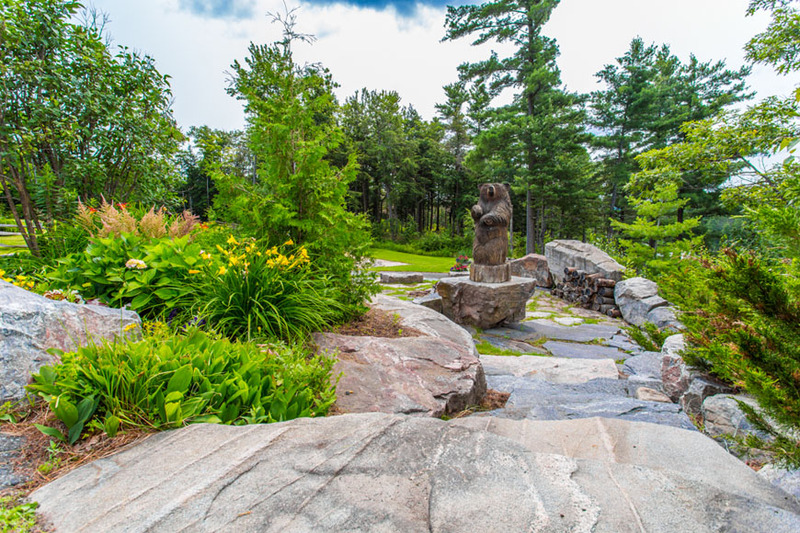 An irrigation system ensures that the colourful terrace gardens are always in bloom. 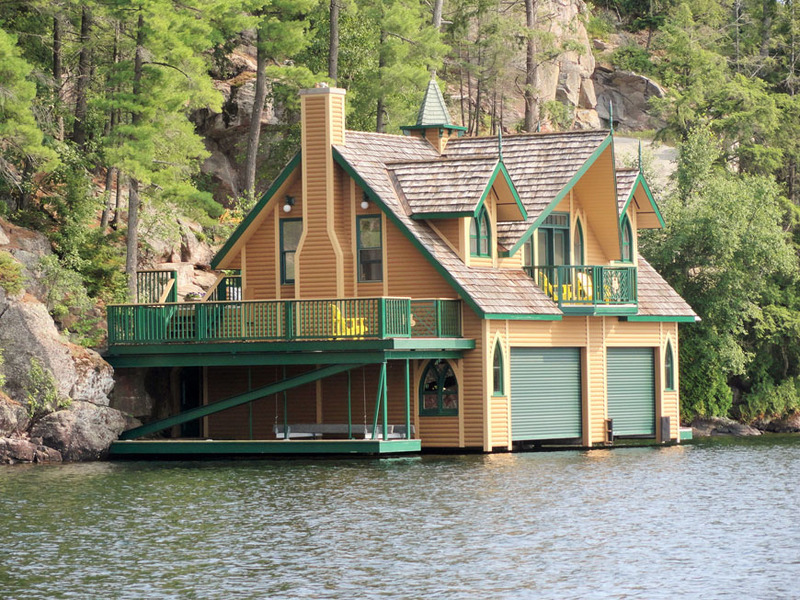 A massive generator powers absolutely everything on the property, right down to the boat lifts in the boathouse. 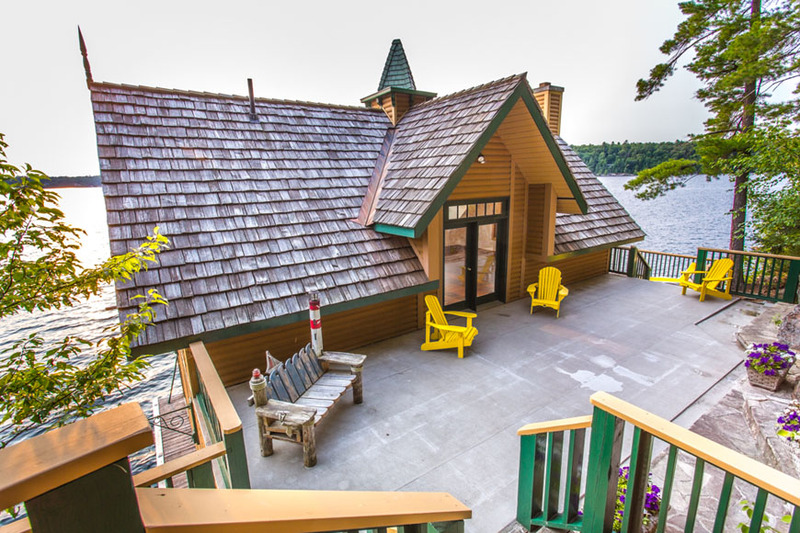 The “dock appeal” of this stately cottage is undeniably incredible, and the property lives up to its regal first impression in every respect. 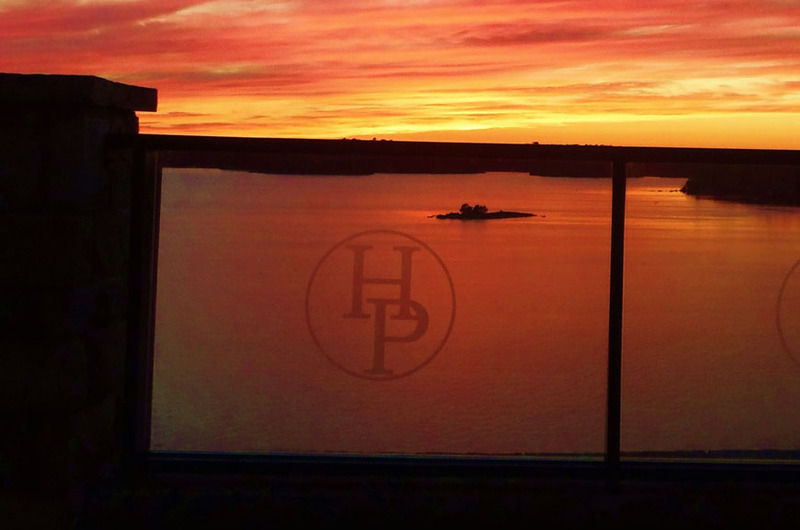 Muskoka’s landmark “High Point” is truly a cottage offering and experience like no other. 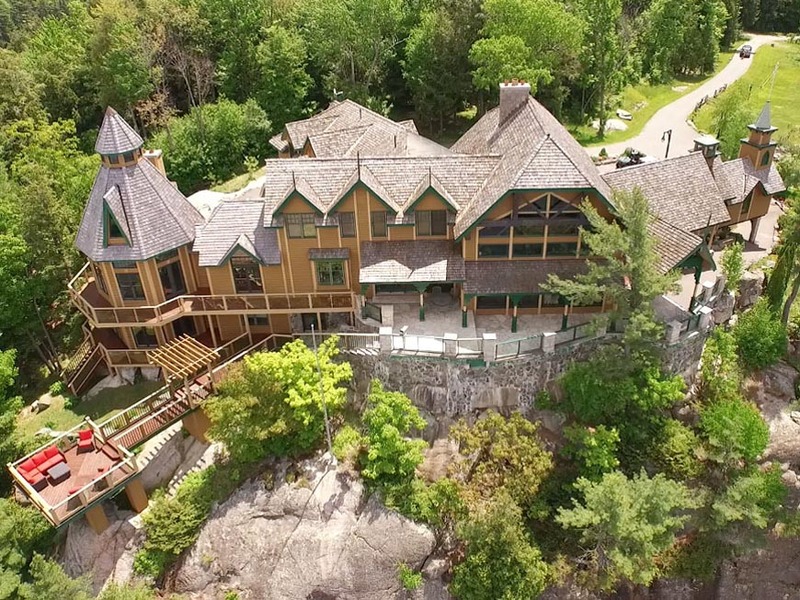 View an aerial video tour of this magnificent property by visiting the “Video Tour” link above.